The catalytic converter is one of the most important parts of the exhaust system as it turns dirty engine exhaust into a cleaner gases that don’t pollute the environment as heavily. Catalytic converters, or cats to use car enthusiast slang, have no moving parts but convert toxic exhaust gases into carbon dioxide and water via ceramic honeycombs that are coated in precious metals that include platinum, palladium, and rhodium among others. Cats are positioned in-line with your exhaust system such that your cars exhaust gases flow through that cat. Based on the Environmental Protection Agency (EPA) mandate, vehicles produced for the 1975 model year and later are required to include a catalytic converter as a measure to reduce vehicle exhaust pollutants. Since then, every road-going vehicle produced in the United States has been manufactured to include a catalytic converter. Similar laws are rapidly being adopted worldwide as humans become increasingly aware of climate change and other environmental issues. One thing to be sure of is that cars built from the 1970s onward will need to have the catalytic converter replaced at some point. Every converter is designed for the lifetime of the vehicle, although fueling issues can cascade to damage catalytic converters if they aren’t fixed in a timely manner. On vehicles newer than 1995, your onboard diagnostic system (OBD for short) may signal an inspection or replacement is needed by turning the check engine light on. On older vehicles, it may be as simple as a failed emissions check to determine that your vehicle is not producing clean enough exhaust. Once replacement is needed, mechanics are faced with a decision in terms of where to source replacement parts: direct OEM replacements versus aftermarket replacements. Click here to see examples of universal catalytic converters. 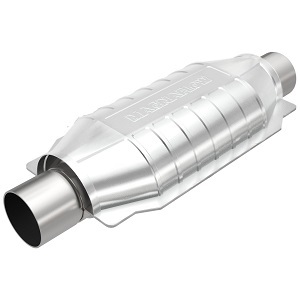 There is a range of universal aftermarket replacement catalytic converters that can are designed to fit any car. For these, all you must do is specify the inlet and outlet size to match up to your exhaust. 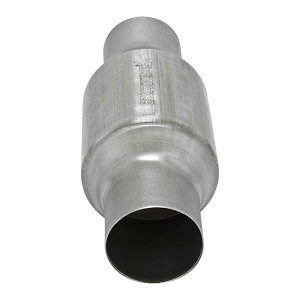 High-flow cats are also available in this style, and catalytic converters often have different body shapes to allow space efficient placement on a wide variety of vehicles. Universal cats are typically the lowest cost option since they are produced in high volumes since they aren’t limited by market size for specific vehicles. While the universal converters are often the least expensive purchase option, their cost can be deceiving depending on your skill level for replacement work. Most of the early cars with catalytic converters will require using some sort of reciprocating saw or cutting tool to remove the original converter as they were most often welded in place. You will then either need to clamp or weld the replacement in. If you don’t know how to weld, don’t have a cutting tool, and really don’t want to be under the car doing the work, you may be better served to just take your vehicle to a qualified exhaust shop and let them do the dirty work. The cost for installing a catalytic converter usually isn’t too bad as muffler shops do this task all day every day. One thing also to note is that if you live in an area or state that imposes additional requirements (such as CARB certification in California), you must make sure your replacement catalytic converter meets these requirements or installing one will disqualify you from passing emissions tests. Click here to see examples of OEM catalytic converters. On many of the cars produced in the early 1990s and later, the catalytic converters are not welded into the exhaust system. They have been designed as a replacement part that doesn’t require cutting or welding, and can be removed and replaced with a bolted clamp or flange on each end that you can access with a ratchet. On occasion, the exhaust bolts will be stuck and difficult to remove, so an impact wrench and some rust penetrant can speed removal. OEM cats have become much easier to replace and typically provide better quality than universal cats. If you live in a state like California, CARB certification usually exists on OEM converters so you don’t have to worry about failing an emissions test. The caveat to easy replacement and good quality is that they will be more expensive than an average universal catalytic converter. As they are certified to air quality standards and vehicle specific, they are often produced in lower volumes than universal cats and as such, manufacturers charge more for them. Click here to find an OEM catalytic converter for your car. Overall there are many causes that can cause a catalytic converter to need replacement. Vehicle wear and tear, rust on the body of the converter, rich fuel mixture, and exhaust contamination from a worn engine are the most common. Your decision to replace your cat with an OEM cat versus an aftermarket cat will have to consider part quality, cost, and local (or state) emission standards. It will be up to you to determine what works the best for your individual situation. Aftermarket and OEM parts are readily available when you determine which will be the best for your vehicle, so choose wisely and enjoy another many miles of environmentally friendly vehicle operation. Happy wrenching!